1. You will receive an email from support(at)businessasap.com letting you know that your new Virtual Server account is ready. The email will include your user name and a link to your password. ASAP uses onetimesecret.com for password sharing, as it is more secure than sharing passwords directly in the email. Click the password hyperlink provided in the email to be directed to onetimesecret.com. 2. Onetimesecret.com will open in your default web browser and it will display a red box in the center of the screen that reads: View Secret. Follow this link. 3. Once you select View Secret, you will see text that reads This message is for you: and a textbox immediately below that. Your password is in the text box. Please note: The secret link is only accessible once, so be sure to save the password for your records before you close onetimesecret.com. 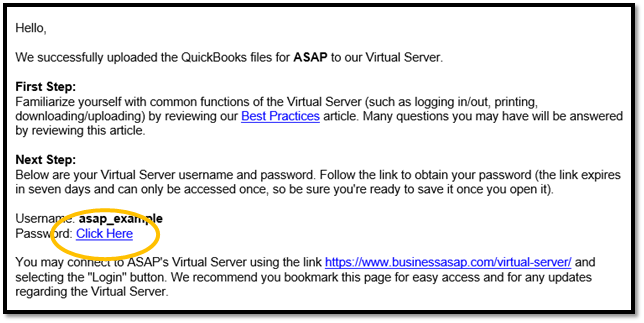 If you receive the message above, you can always email support(at)businessasap.com, identify yourself and your Virtual Server username, and request a new onetimesecret.com link to your password.